10. Demonstrated your skill in photographic composition and artistry to everyone around you. 9. Shown people carrying expensive cameras with multiple lenses that you know a thing or two about cameras as well. 8. Given the “all clear” to home burglars when you immediately post your photo to Facebook and Instagram. 7. Rubbed in how much vacation fun you’re having to everyone who is still at work. 6. Found a new way to cut in line in queues – the selfie stick jammed in front of people “marks your spot”. 5. Helped the local economy by buying a selfie stick from one of the thousands of venders selling them. 4. Avoided the social interaction with a stranger that happens when people courteously “swap photographer duties”. 2. Found a fantastic way to occupy time while waiting in line, as opposed to something old-fashioned, such as reading a guidebook or talking to people. 1. Confirmed to the doubters that this historical site older than the reign of the Romans now exists. 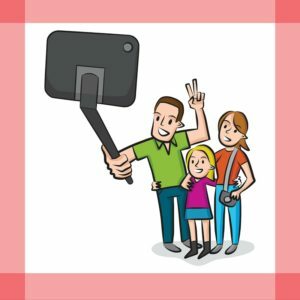 Your selfie stick photo proves it! Do you agree with me or not? Are you a lover or hater of selfie sticks? Let me know on Facebook GailMencini.Author or Twitter @GailMencini! 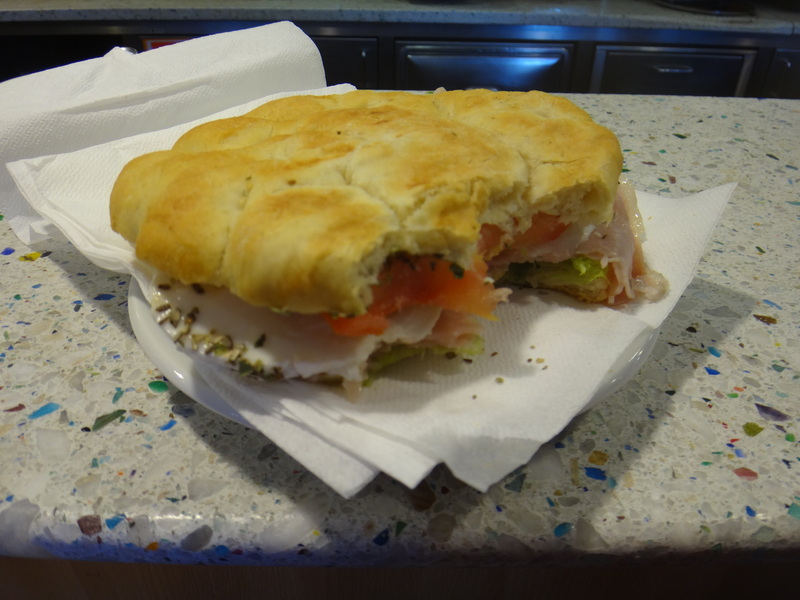 While in Tuscany, we visited the sunny Mediterranean coast. 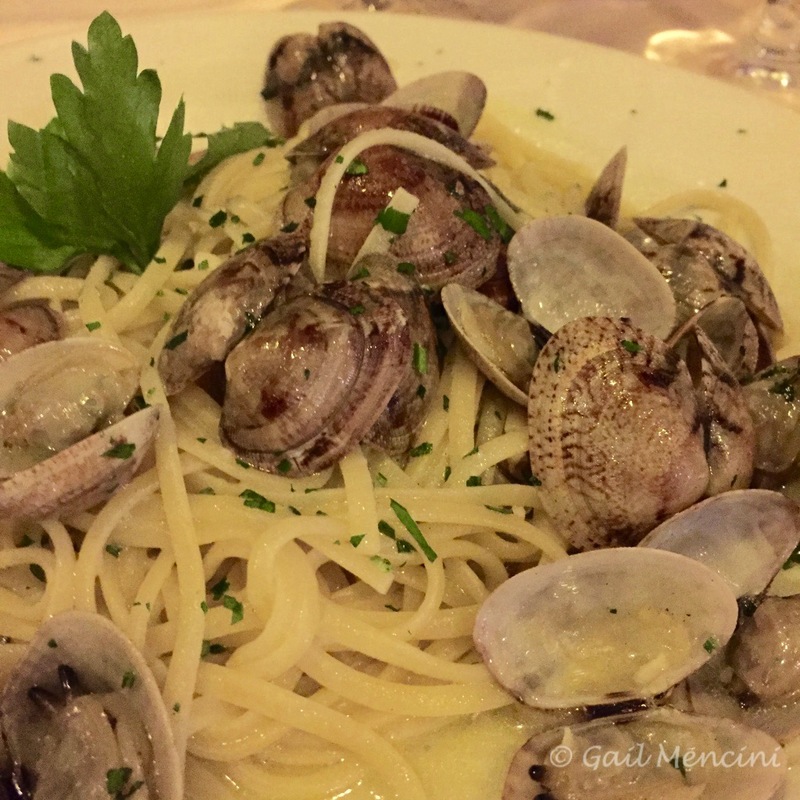 One of my favorite dishes was Linguine with Clams. I adapted the traditional recipe to make it silkier and taste similar to my memory from those warm summer evenings. I always prefer a small shell clam, such as Manila or Pasta Neck clams, which are also known as Spaghetti clams. I love this recipe because it is both simple to prepare and a year-round comfort food. Scrub the fresh clams and then soak them in cold water in the refrigerator for one hour. Fill the pasta pot with water (3/4 full) and add two healthy pinches of salt. Start boiling the water after the clams have soaked about thirty or forty minutes. Rinse the drained canned clams and remove shell fragments, if any. Melt 4 tablespoons of butter and the olive oil over medium heat. Add the garlic and pepper flakes after the butter melts. As soon as you smell the garlic, add the fresh clams and cover the pan. Shake the pan occasionally. Remove the clams as they open, which will be about 5 minutes if using small clams. Place the opened clams in a large, warmed pasta serving bowl and cover with aluminum foil. Discard any clams that do not open. Raise the heat on the clam broth to medium high and add the strained clam juice. The liquid will reduce into a sauce while the pasta cooks. After four minutes, add the chopped clams and all but 2 tablespoons of parsley to the clam sauce. When you raise the heat on the broth, add the pasta to the boiling water and stir to prevent it from sticking. Cook the linguine one minute less than the shortest time suggested on the package. Scoop the linguine out of the pot with a large scoop strainer/colander or tongs, rather than pouring the pasta into a colander. This allows some pasta water to cling to the noodles. Add the pasta and the white pepper into the clam sauce. Stir to coat the noodles with the sauce and cook for one minute. Stir in the remaining 2 tablespoons of butter. Gently mix the opened clams and any accumulated liquid into the pasta. Season to taste with salt and then freshly ground pepper, if using. Transfer the pasta to the serving bowl and sprinkle with the remaining parsley. *If you don’t have fresh clams, you can substitute an additional can of clams and their fluid. 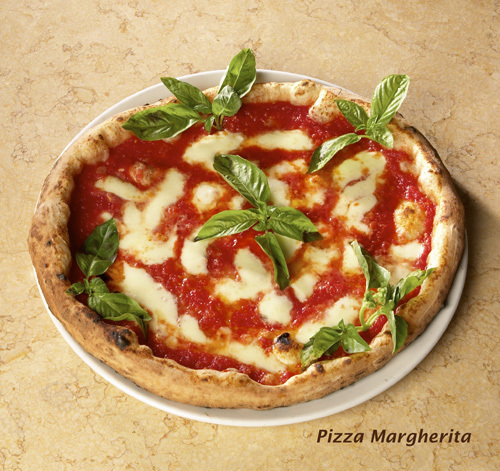 Enjoy with a glass of your favorite Italian wine! 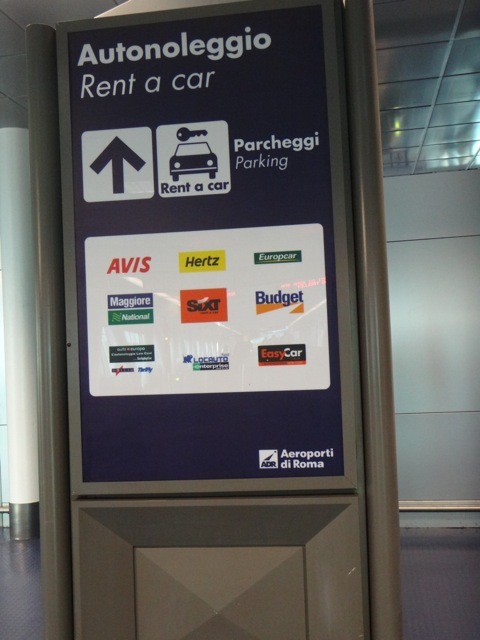 You’re Renting a Car in Italy … Now What? First of all, compare offers from different rental agencies, but make sure the quotes are comparable. There are many factors in car rental agreements that weigh into your decision—tax, insurance, local fees, hours of operation of the rental counter, a possible fee attributable to picking it up at the airport, deductibles on insurance, and models of cars. Do you need insurance? In Italy, I would say yes. Even though in the U.S. our credit card company covers us for car insurance, in Italy we need to elect the optional insurance from the rental agency. You should check your own coverage, as this may vary between companies. Know whether it is automatic or manual in advance and ask what kind of gas it takes. 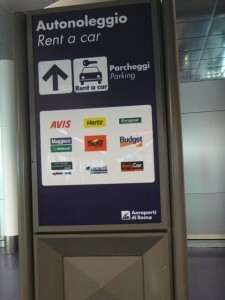 Many rental cars in Europe are manual shift. If you need or want an automatic transmission, make certain that is specified in your reservation. Some rental cars require diesel fuel, which is less expensive. When you pick it up, find out what kind of fuel your rental requires—there may be a sticker on the car. 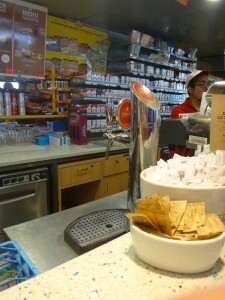 Both unleaded and diesel gasoline are commonly available in Italy. Figure out how to find reverse. I know, this seems obvious to anyone familiar with manual shifts. I do, however, personally know a handful of experienced American drivers (who shall remain nameless) that had the misfortune of tapping the car in front of them in the parking garage when they tried to put their rental car into reverse! The trick is normally to put your hand on the gearshift, pull up on the lever under the gear knob, and then ease it into reverse. When should you pick up the car? If you’re planning on being in a large city such as Rome, Milan, or Florence for a few days, you may be wise to wait until you are ready to leave the city. You probably will want to limit your driving in the bustling cities and you can save money by waiting until you’re ready to tour the countryside. If you do pick up a car after the long transatlantic flight, know that you will be jet lagged. You may be interested in a jolt of caffeine before driving. 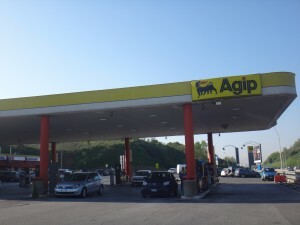 Ever been to an Agip? This is the service station we stopped at after landing in the Rome airport and picking up our rental car. Why? … Peroni beer on tap. 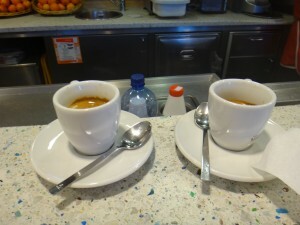 … were what we needed before hitting the road. Normally at Agips and other service stations, you first pay for your items at the cashier. Hold onto your receipt as they may ask you to show it when you then order your food and beverages at the counter. Now it’s time to hit the road! victory, though, as it was the first wine in Italy to receive the coveted DOCG designation. 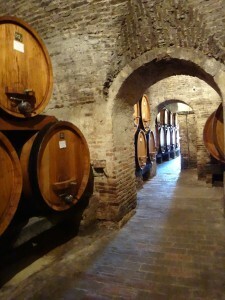 Fewer people, however, know that the wine Vino Nobile di Montepulciano DOCG, also produced from Tuscany’s Sangiovese grape, was the second wine to be designated a DOCG wine. If you missed my blog on the wine designations in Italy—DOCG, DOC, IGT, and VDT, you can brush up on your wine lingo and understanding by reading DOCG, DOC, IGT, and VDT Italian Wines – What do these mean? . The difference between Brunello di Montalcino and Vino Nobile di Montepulciano is twofold—territory and process. The DOCG designations are for a particular terrior and geographic area within Italy. These appellations sit side-by-side in the Siena province, with the hill towns of Montalcino and Montepulciano about 35 km or 22 miles apart by scenic, curving road. Since receiving their DOCG designation, the number of wine producers and hectares planted with Sangiovese grapes has grown dramatically in both appellations. For example, in 1960 there were 11 Brunello di Montalcino producers and 1,000 ha in vineyards. These numbers grew to 230 producers in 2006, with 12,000 ha in vineyards. The cause of the rapid expansion can be largely attributed to the expanded ability to market these fine wines (as a first a DOC and later a DOCG wine) to consumers in the United States and United Kingdom. 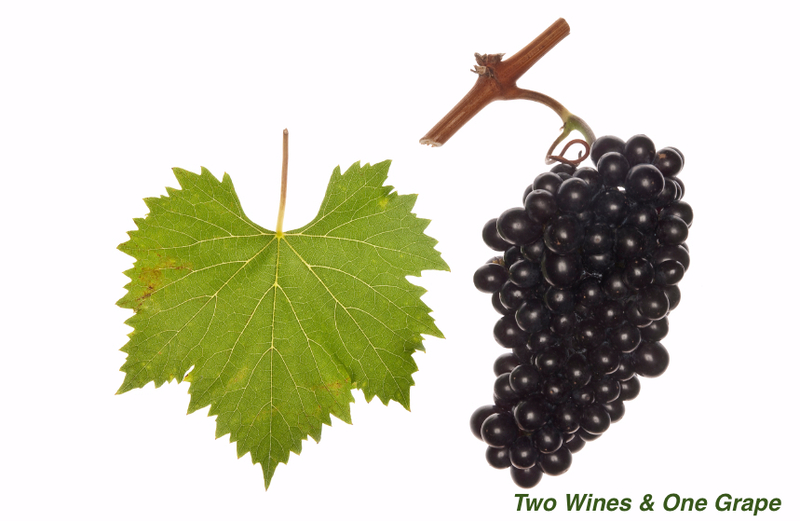 How does one grape turn into two distinctly different wines? Once you account for the difference of terrior, the simplified answer is the amount of time the wine is aged and the grapes used. Brunello di Montalcino is produced 100% from Sangiovese and cannot be released for sale until five years after the harvest. The requirements to be designated a DOCG wine is that Brunello must be aged in oak for at least 2 years and at least 4 months in the bottle before being released. Brunello di Montalcino cannot be released for sale until five years after the harvest. Vino Nobile di Montepulciano is made at least 70% from Sangiovese, with a maximum of 20% from Canaiolo grapes and a maximum of 20% from other permitted grapes, such as Mammolo. It must be aged for 2 years from the January 1st after the harvest, with a minimum of 12 months in oak. What about the flavor, suitability for aging, compatibility with food? Ooh, that’s for another blog, one that I must—for research’s sake—pen with a tasting glass of each by my side and perhaps even some tidbits of food. If you want to visit the small towns in Italy during your vacation, you will want to consider renting a car. 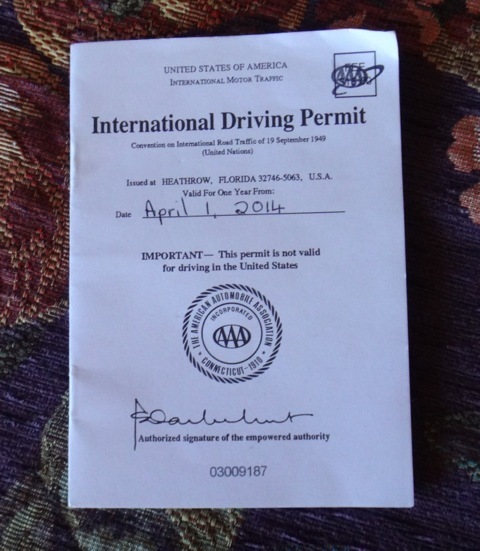 You should have an International Drivers License, which is easily obtained in the U.S.
You will need to share the road with motorcycles, scooters, bicycles, pedestrians, and farm equipment — are you up for the challenge? Even with a car, especially if you’re staying near the city center, you may still be lugging your baggage through the cobblestone streets as parking may be blocks from your hotel! Your destination and lodging — are they easily reached by public transit? Your budget — compare the two options and decide which is best. Which of the pros and cons above strike you as the most and least hassle? Do you have the driving skill and courage to drive in Italy? Seriously, not everyone does and there is no shame in it. 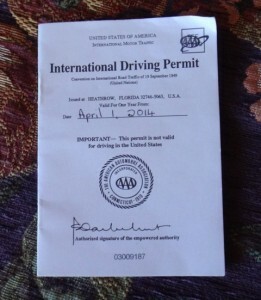 Italians are used to driving there. Tourists, especially those accustomed to wide-open spaces, freeways, and huge mall parking lots, may not be comfortable—or adept—at driving in Italy. You may choose to have someone else do the driving. 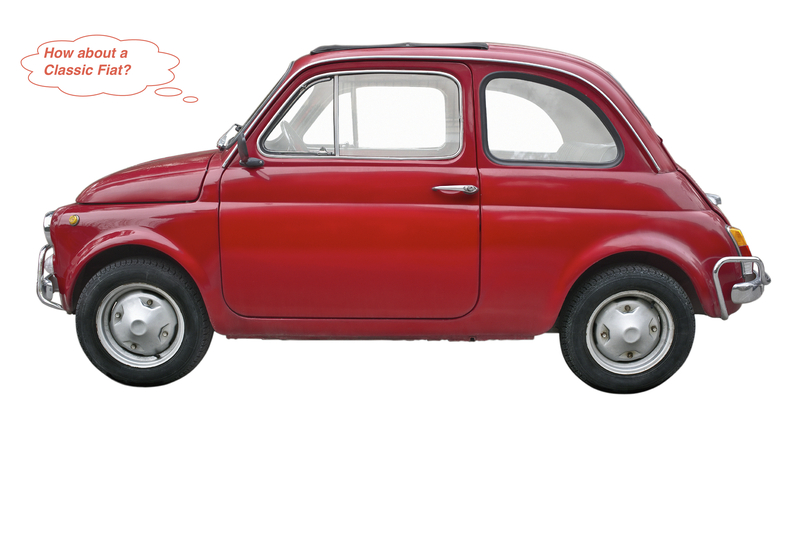 Yes, there are abundant car services for hire to negotiate transfers in Italy. Not inexpensive, but something to consider if you don’t like the other options. This is your vacation! Choose the method of transit that works in your budget and allows you to best enjoy the trip. Buon Viaggio! Or, I could tell you the other truth about myself. I love to eat good food.